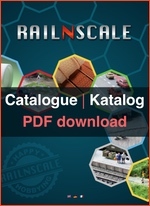 Does RAILNSCALE sell painted kits too? No, only unpainted kits are available. 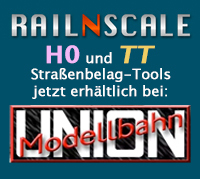 Does RAILNSCALE sell kits in other scales too, like H0 for example? We focus is on N-scale (1/160) kits. It is however possible to up-scale our kits to 1/148, 1/144 or TT-scale (1/120). The larger the model, the more expensive a kit will become. Do not hesitate to contact us in case you wish for an up-scaled model. Our H0 (1/87) range will be limited to ‘tools’ only. Unfortunately it is not possible to down-scale our kits to Z-scale (1/220). What paint do I need to paint the kits? Best is to apply a primer first. Alls sorts of hobby paint like Revell Email Color, Humbrol Enamel, Tamiya, etc can be used. What glue do I need to assemble the kits? Where can I buy modelling clay? Where can I buy Microscale Kristal Klear? Most model rail road shops will have Kristal Klear. etchIT also sells Kristal Klear.